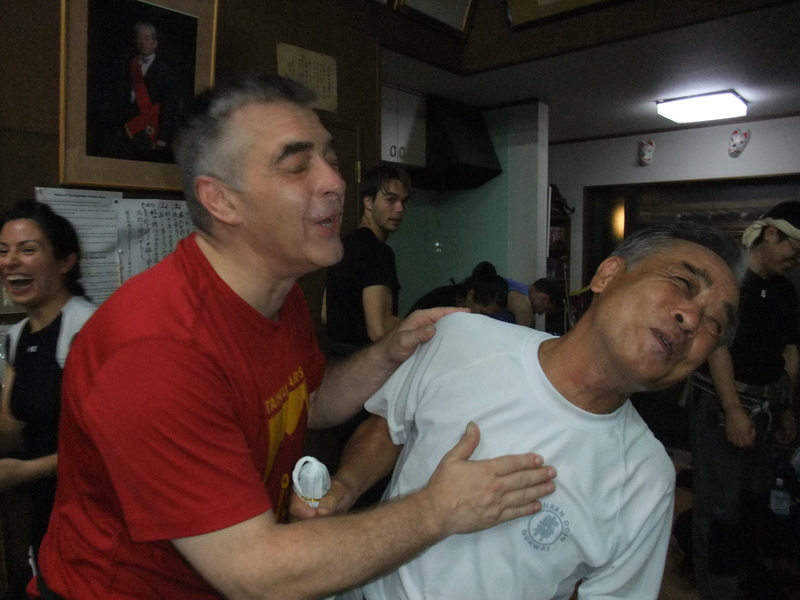 The bujinkan is much more than a fighting system, it is about behaving like a true human being. Since we came here both Hatsumi sensei and Nagato sensei have been speaking about asobi, playfulness. I remember sensei saying once that « missing a class was ok but that missing a joyful moment was wrong ». Happiness has to be found and lived when the occasion shows up. And that was the case on Thursday night. 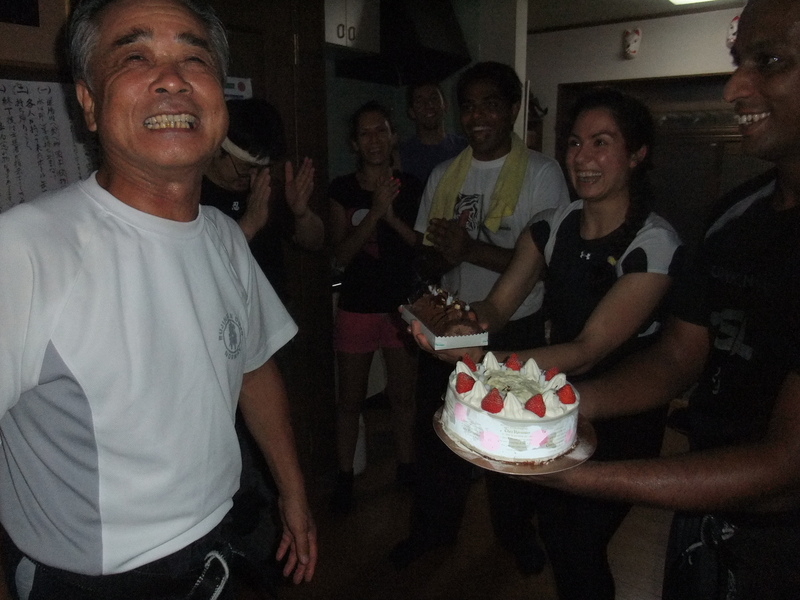 Noguchi sensei was born on the 6th of August so for his last class I organized a small birthday party for him after training. We celebrated his 68th birthday with all the students who attended the class. That was a true bujinkan evening. 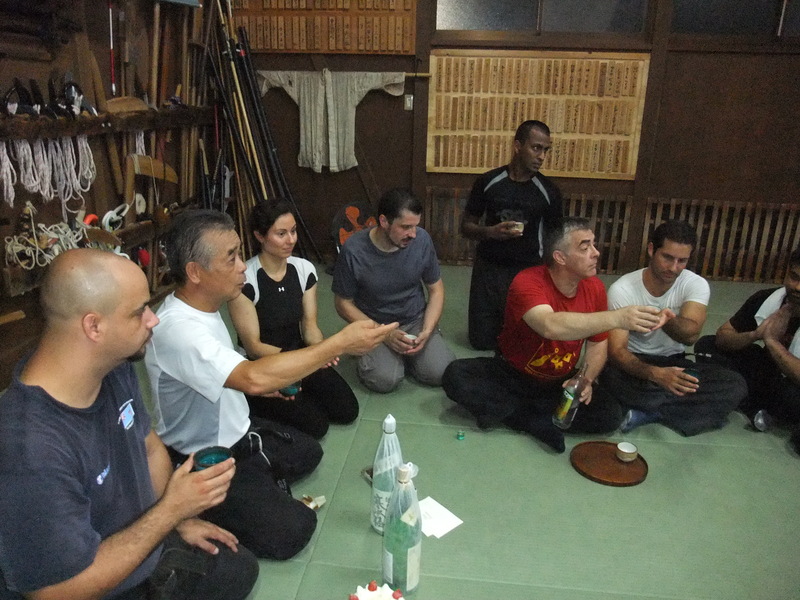 Asobi and happiness altogether: good training in the takagi yôshin ryû and a nice b-day party. Birthdays are occasions to gather and to know people from a different perspective. 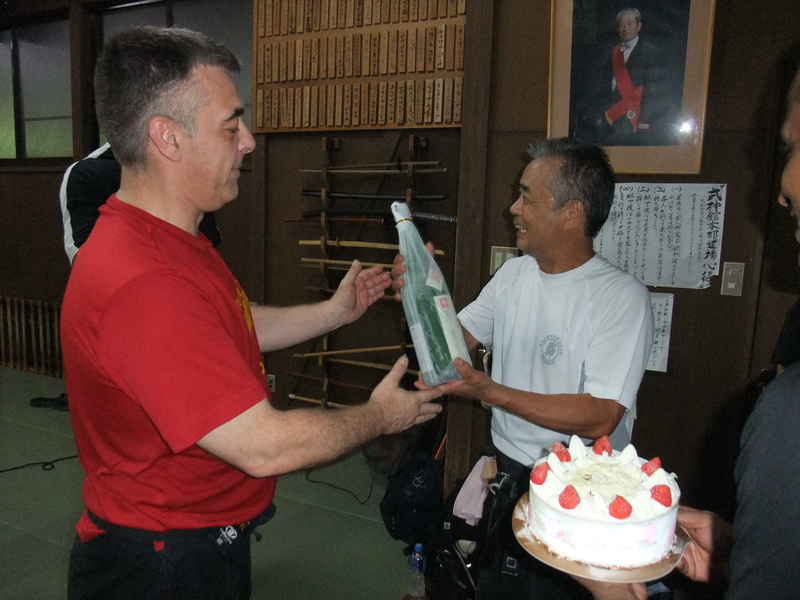 We had brought cakes and sake and offered them to Noguchi sensei who seemed very touched by it. We all shared a little shoshu with him with a strong sense of friendship within this small buyu community. 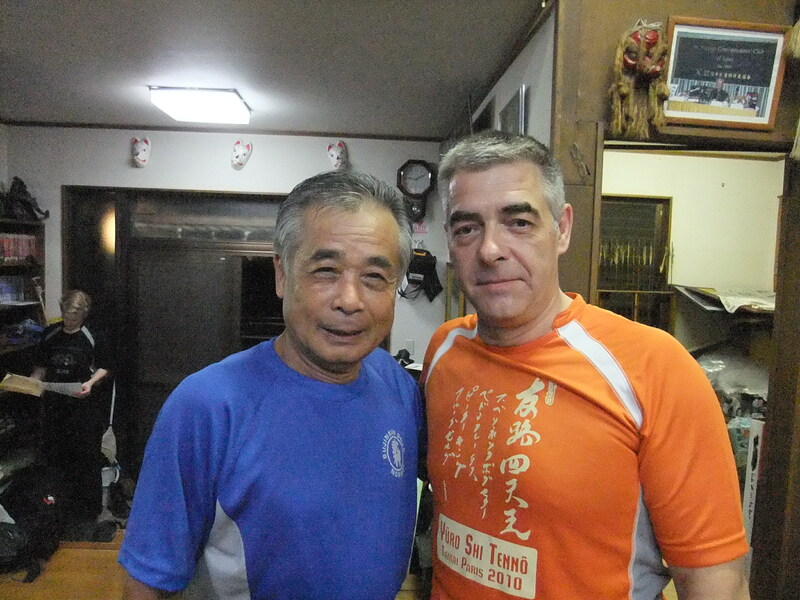 Noguchi sensei has been the shihan who has helped me the most in my bujinkan training and I like to think that my taijutsu is the result of his many tips that he gave to me since 1990. To organize this was the least I could do as for once I was here in Japan on the good date. When I got promoted by Hatsumi sensei to Jûdan back in 1993, the hombu dôjô didn’t exist and sensei was giving classes when people would showed up. Many times with Pedro, sensei would ask us if we would like to have some training the following day! This is in 1993 that Hatsumi sensei asked me to train exclusively with him and Noguchi sensei. I must admit that I was more attracted to Nagato sensei’s style in that time and that Noguchi sensei style was so far from what I considered to be my “natural movement” that I was surprised. As always, it proved to me that sensei knew what to do with me and forcing me to train only with Noguchi sensei has been the best thing that could happen to me. In 1997 at the DKMS, with the opening of the brand new hombu dôjô, sensei told me that from now on I could train with the shi tennô teaching there. But the four years I spent following only one teacher created the taijutsu I have today. Noguchi sensei is an excellent budôka and a true human being and I am proud to call myself one of his students. Omedetô Gozaimasu! Noguchi Sensei!! !…best wishes! Thank Shihan Arnaud for this excellent blog!! !.